But what if you worked in a lab where smells are central to your product? Ginkgo Bioworks has a factory with over a billion workers who are busy producing designer scents for food. The company uses large-scale fermentation to produce yeast that is genetically modified to produce scents and flavors like grapes, oranges, roses or peaches. Scientists have known about DNA since the late 1800s, however, its double helix structure wasn’t known until 1953. In the short span of 60+ years, a new field of study has rapidly emerged. Synthetic biology is an umbrella term that incorporates genetic engineering, molecular biology, systems biology, biotechnology, computer engineering and a slew of other biosciences. The goal is to “design and construct biological modules, systems, and machines for useful purpose”. How useful? Genetically modified yeasts are used to produce key biopharmaceuticals, like human serum albumin, hepatitis vaccines, and human papillomavirus vaccines. They are also used to produce insulin for the 100 million people worldwide that need it. The total for the insulin market alone was $12 billion USD in 2011 and that is expected to balloon to $32 billion USD by 2018. With genetic engineering, there is always the discussion of ethics and oversight. The synthetic biologists that are trained today have the advantage of learning from past mistakes. 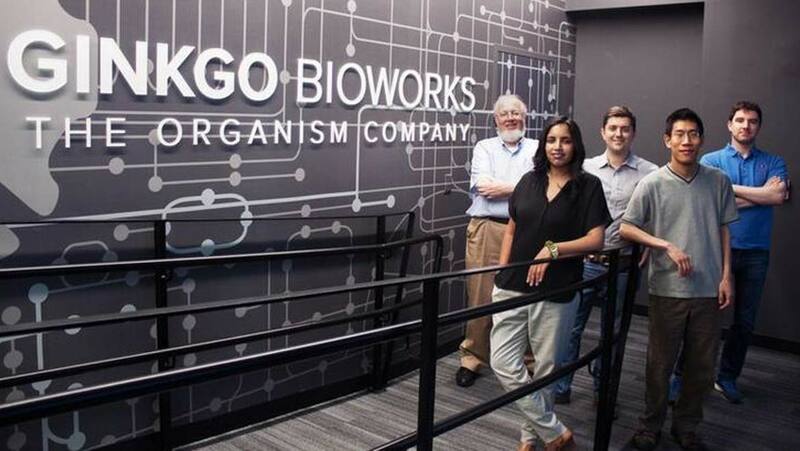 It is very fortunate for Ginkgo Bioworks to have Tom Knight on their team. Knight is a former MIT professor, now known as the father of synthetic biology. He has a personal stake in ensuring the success of not only his company, but also the industry as a whole. Advances in both DNA-sequencing and synthesis have led to the development of assembly line microbiology production. The process begins by constructing a workforce that can mass produce one compound. A row of computers is used by to design DNA sequences for a particular product. This is sent to a robotic system that then synthesizes the sequence, which is then inserted into cells. The newly programmed yeast is cultivated and another automated system will analyze the batch using liquid chromatography and mass spectrometry. Ginkgo isn’t selling the yeast; instead, the sell the products they produce. By crossing the genetics of a rose into the yeast, they can produce fragrant rose oil quickly. Aside from flavors and food, some areas this technology is expanding into is manufacturing chemical compounds for drugs and plastics. Ginkgo Bioworks isn’t the only player in the designer microorganism game. Novamont is the world leader in bioplastics. Teamed with Genomatica, they opened the MATER-BIOTECH plant in north Italy, which is expected to produce 30,000 tons of 1,4-butanediol (BDO) a year from sugar. Used as an intermediary chemical in bioplastic production, using this BDO will save and an estimated 56% of greenhouse emissions. Companies are now pushing into markets in new and clever ways, producing fine and exotic chemicals. So far however, they have been unable to break into the biofuels market. Gingko Bioworks notes that production of six fine chemicals for partner companies can net between $10-10,000 per kilogram. Unfortunately, the cost of oil has remained constant and petroleum trading is done in high volume at low cost, on the order of just $1 per kilogram.